More than 100 delegates gathered in Kelowna, Oct. 28 and 29, representing every corner of B.C., to learn about the newest information and technologies available to prepare their communities for the tremendous rains that are expected with climate change. The event was presented by the Okanagan Basin Water Board in partnership with the BC Water and Waste Association and with funding support through Natural Resources Canada’s Regional Adaptation Collaboratives Program. Delegates included planners, engineers, and landscape architects, both in the public and private sector, as well as elected officials – those who will be integral to changing the way we develop our communities. We would like to thank our sponsors, Associated Engineering, Summerhill Pyramid Winery and Urban Systems for helping ensure a successful learning event. Below, you will find presentations from the workshop, news releases and news clippings. We invite you to view the materials and work with us, recognizing the value of rainwater as part of building a sustainable future for all. The purpose was to learn about the newest information and technologies available to prepare B.C. communities for the tremendous rains expected with climate change. The OBWB has now released a report that summarizes a comprehensive set of recommendations that came out of the workshop, and provides an overview of the topics and case studies presented. Why is Rainwater Management a Critical Tool for Adaption to Climate Change?- Chris Johnston, P.Eng. Site Adaptive Planning & Design – Paul de Greeff, RLA. & Scott Murdoch, RLA, R.P. Bio. Rain Gardens – Top 10 Design Considerations – Craig Kipkie M.Sc., P.Eng. Managing Stormwater in a Changing Climate – Home Depot development, Courtenay – Innovative On-Site Rainwater/Stormwater Measures – Kevin Lagan P. Eng. Stormwater Retrofit planning and design – Scott Murdoch, RLA, R.P.Bio. Adapting to Climate Change in Prince George – Dave Dyer, P. Eng. Topsoil Technical Primer – Rémi Dubé, P.Eng. 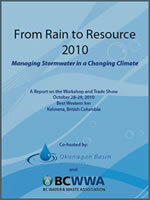 Photos of “From Rain to Resource” can be found on the OBWB’s Okanagan WaterWise Facebook gallery page. We invite you to take a look and continue the conversation by following Okanagan WaterWise on Facebook. With federal funding support through Natural Resources Canada’s Regional Adaptation Collaboratives Program. Missed our Water Supply webinar?